If you have followed the advice on this page we have some additional advice for you which you can find here. If your cat hasn't come home, don’t panic! Cats will often go missing only to arrive home later that evening or in some cases months later as though nothing has happened! Thoroughly check every nook and cranny of your house and any outdoor buildings such as garages and sheds. Post details of your missing cat on cat-related social media pages and groups too, like contact the Cats Protection Canterbury Facebook page and other local social media pages. Post photos on your own social media profiles too to notify all your friends. Contact local vets – all practices in the area, not just your own. 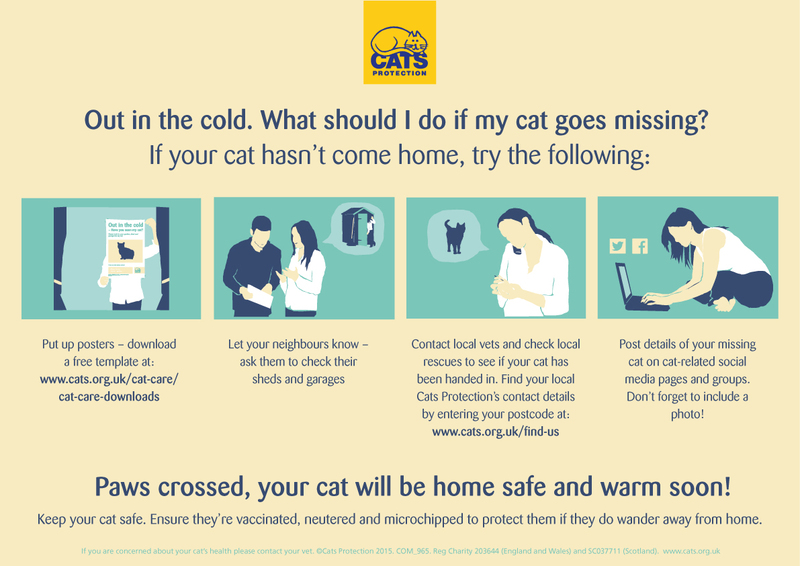 If your cat is microchipped, inform Petlog and they will automatically send out an alert to animal professionals (who have signed up for the service) within a 30 mile radius of where your cat went missing. Check local rescues to see if your cat has been handed in. Keep your cat safe. Ensure they’re vaccinated, neutered and microchipped to protect them if they do wander away from home. Needing to Rehome Your Cat?